INTRODUCTION:Thrombocytopenia is a common entity in Chronic Liver Disease (CLD) with or without cirrhosis. Liver biopsy is the gold standard for diagnosis and prognosis of CLD. Platelet count is imperative before percutaneous liver biopsy. Platelet transfusion requires over night hospitalization with transfusion associated morbidities and cost burden. Romiplostim, a fusion protein- Romiplostim Thrombopoietin Analogue (TPO), is a hormone that regulates platelet production approved in idiopathic thrombocytopenic purpura(ITP). This study evaluates single use of Romiplostim two week prior to liver biopsy to avoid biopsy related morbidity and mortality. METHODS: Sixty-five patients(n=65), (mean age:56years; M:F-2:1) with Hepatitis C: 37/65(57%); hepatitis B(HBV) 7(15.5%), Alcoholic Cirrhosis 10(15%); Non-Alcoholic steato-hepatitis(NASH) 3(5%), Primary biliary cirrhosis(PBC) 6(9%) with pre-biopsy mean platelet count 77k; Mean MELD score 20, mode fibrotic score F4 were randomized in blinded fashion into three groups: Group A(n=18), received 7 units of platelet transfusion at night for the morning procedure. Group B(n=23) received Romiplostim 500mcg sc given two weeks prior to the procedure, and Group C(n=24) Elthrombopag orally 75 mg/day for two weeks. Platelet count was repeated two hours prior and Post-biopsy in four weeks in all groups. Inclusion criteria:CLD with thrombocytopenia. Exclusion Criteria: ITP, drug induced thrombocytopenia, HIV, Hepatocellular carcinoma, Hemangioma, Auto-immune thrombocytopenia, use of steroids, Myelodysplastic syndrome. Side Effects: Nausea 4(8.8%), vomiting 2(4%), dry mouth 2(4%), headache 6(13%), Insomnia 3(6.6%), irritability 3(6.6%), local skin rash 9(20%), shortness of breath 1(2%), myalgia 11(24%) arthralgia(15%) Erythema(9%) in post-biopsy and 39% post-Injection site. No post-biopsy bleeding or hematoma was recorded. RESULTS: Single use TPO showed a higher platelet count pre-operatively as well as on follow through (4 week platelet count after the procedure) as compared to platelet transfusion or Elthrombopag. The findings were statistically significant with the p-values of TPO versus platelet transfusion being <0.001 while that of Elthrombopag versus platelet transfusion being <0.05. 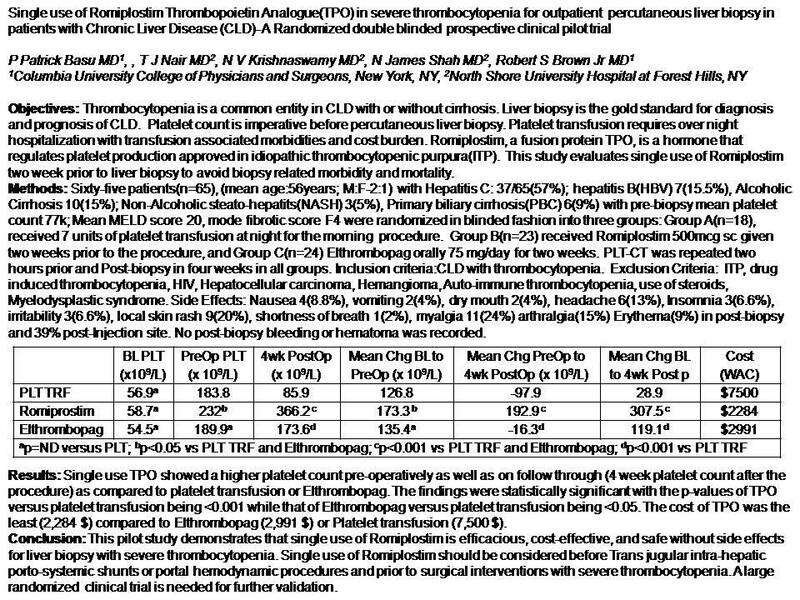 The cost of TPO was the least (2,284 $) compared to Elthrombopag (2,991 $) or Platelet transfusion (7,500 $). CONCLUSIONS: This pilot study demonstrates that single use of Romiplostim is efficacious, cost-effective, and safe without side effects for liver biopsy with severe thrombocytopenia. Single use of Romiplostim should be considered before Trans jugular intra-hepatic porto-systemic shunts or portal hemodynamic procedures and prior to surgical interventions with severe thrombocytopenia. A large randomized clinical trial is needed for further validation.